I had a pretty good week this week. We had some miserably cold weather earlier in the week, and what better place to go when it's cold than MEXICO!?! So we went to La Carreta to eat lunch, the first time we've been out to eat since Oct. 18. It was fabulous. Drew stayed with his grandmother, and we went to eat guacamole, queso fundido, margarita, enchiladas, fried ice cream, and chips and salsa. OMG. It was like heaven. I went to see Sweeney Todd on Friday, woohoo. That movie was messed up. But I really enjoyed it EXCEPT for the fact that the entire thing is sung. I hate musicals. I HATE musicals. But this being Tim Burton I could not miss it. I managed to get past the singing and enjoyed all the grizzly blood spewing and perversity. Ha ha. We've been cooking fools around here. Dave made clam dip and seafood casserole and I made creole sausage gumbo-esque stuff, Italian white bean soup, and turkey meat loaf. I bought another set of shelves for the basement and got them assembled, and most of Drew's toys arranged on them in rubbermaid containers. We are SO lucky that Drew has more toys than any kid has a right to have, all given by our friends. He is ALL SET for the next few years. We are actually going to impose a toy moratorium for the next year because there's no way he could possibly play with all the ones he already has. Anyway-- I'm obsessed with getting our basement organized and I was all excited because Target had the wire shelving on sale last week but when we went they only had ONE box left, so that was all we could get. I obsess about getting more and getting things put away proper. Got to try out the new Kitchen Aid mixer this week and it's really fun. Dave said it could only be used for "evil" but I proved him wrong and we tried it out with the clam dip and the meatloaf and it did great. I'm a believer. Day 6 and the kitchen table is still clean!!! Good shopping day at Target! I got a really ugly green tunic shirt which I kind of liked (does that make sense??) for 5 American dollar, and a sweater for 7 American dollar. Also I have been wanting a pair of Sketchers like this but they're pretty spendy, even on sale, so I found some at Target on Clearance for 8 American dollar in my size even!!! Why did nobody tell me about this?? I cannot believe that I only just found out about a Tim Burton movie less than a month before its release. I am disgusted with myself. I was sitting here on my computer last night doing God knows what, and Dave turns to me and says, "Are you paying attention to this," gesturing to the tv behind me. I turned around and caught only the last few seconds of what was unmistakably a Tim Burton movie trailer, with all the old folks present like Johnny Depp, Helena Bonham Carter and a NEW guy to the Tim Burton world, ALAN RICKMAN!!! Now the TB family is complete. I have thoroughly enjoyed Mr. Rickman for some time now, in all the Harry Potter movies, Dogma, Love Actually and probably some other things too. Something thrilling to look forward to. I am SO there. Apparently Sweeney Todd is a "real" fictional character from old 19th century English penny novels. A barber serial killer, LOL! 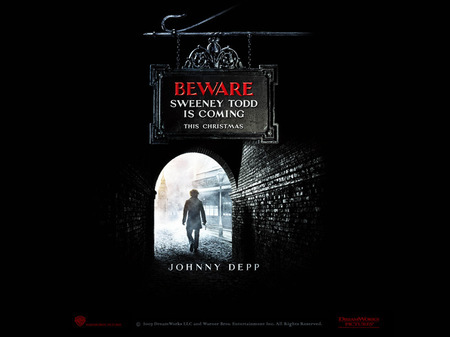 I don't know, somehow seeing that trailer suddenly made me think this movie is gonna be all Edward Scissorhands/Willy Wonka with the dark and gray ambiance of Sleepy Hollow. Not that there's anything wrong with that.